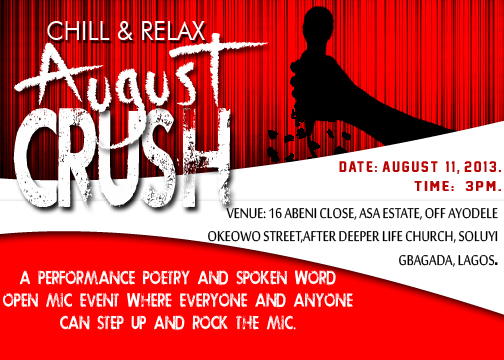 WORD UP: Chill and Relax: August Crush (an Open Mic Spoken Word Poetry Event) holds on August 11, 2013. Chill and Relax: August Crush (an Open Mic Spoken Word Poetry Event) holds on August 11, 2013. This is a Performance Poetry and Spoken Word open mic event where everyone and anyone can step up and rock the mic.